My Mom's birthday is on St. Patrick's Day so I often make her a themed card. This year I made her a cheerful "crazy" card using Karen Burniston's Rectangle Pull Card die. I love her designs! The dies make it so easy to create cards that flip, pop, and otherwise rock in a fun interactive way. This one lets you add a fun spinner element that pops up at you when you open the card. Open the card and… POP! The card is held closed by tucking he leading fold under the little tab. When you pull on the ends of the card, it opens up and the rainbow pops up into place! 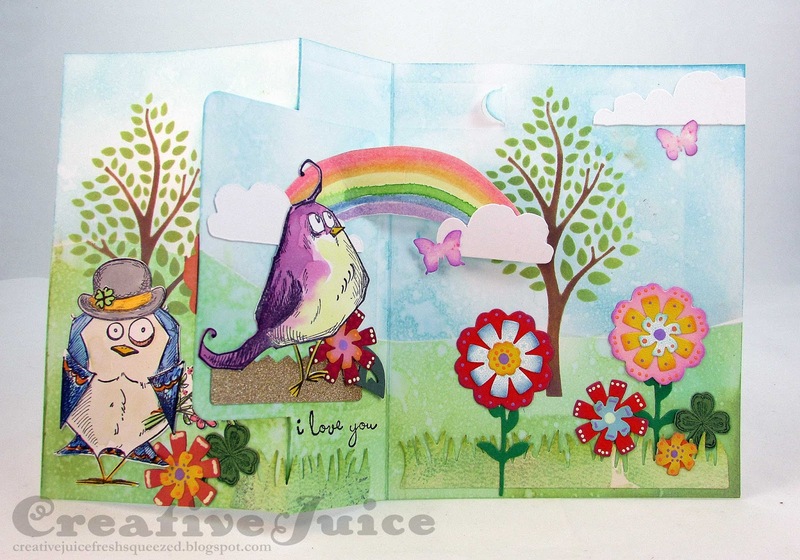 The background of the card is created from blended Distress Oxide Inks (still having lots of fun playing with these!) Of course the Tim Holtz Crazy Collection is always good for creating a humorous card. I love these birds! 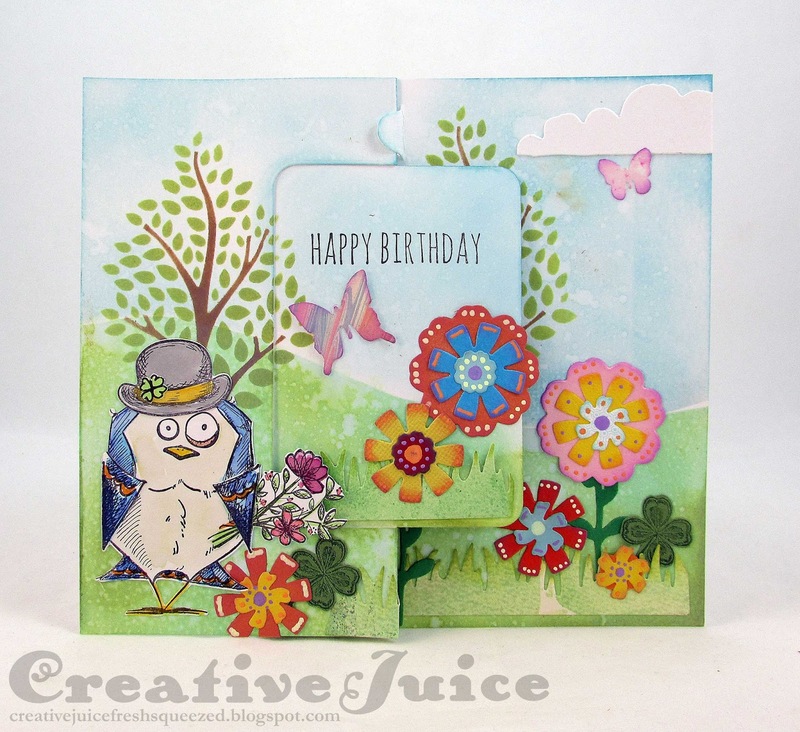 I added lots of cheerful and colorful diecut flowers with Souffle Pen detailing. My Mom loved her card and now I can share it here online because we celebrated her birthday this evening. =) Thanks for stopping by for a look! I'm entering this into the Simon Says Stamp Monday Challenge, Handmade Flowers and the Simon Says Stamp Wednesday Challenge, Bit O' Green (lots of green here!) With the fancy folding this also fits for the Frilly & Funkie Challenge, "You've Got to Know When to Fold 'em." I'm also now on Instagram! (finally!!) You can find me @creativejuicefreshsqueezed if you'd like to keep tabs on me that way. This is wonderful Lisa, I love it. Happy belated Birthday to your Mom! I too was born on St Pat. 's Day and my Mom always had a hard time buying a card for both occasions. (PLUS, my oldest sister was born on Halloween! LOL) My SIL shares my birthday also, so I always tried to make her a dual occasion card! What a lovely scene that you created! It is choke-full of cuteness and sweetness! So glad that you join the fun over Simon Says Stamp Wednesday “Bit O’ Green” Challenge! Awesome details and design! Super work! Love that pop up surprise when you open the card! Beautiful design and she is going to love it! Thanks for playing along with us at the Frilly and Funkie Challenge!